It&apos;s Dr. Seuss week at my four year old&apos;s school! 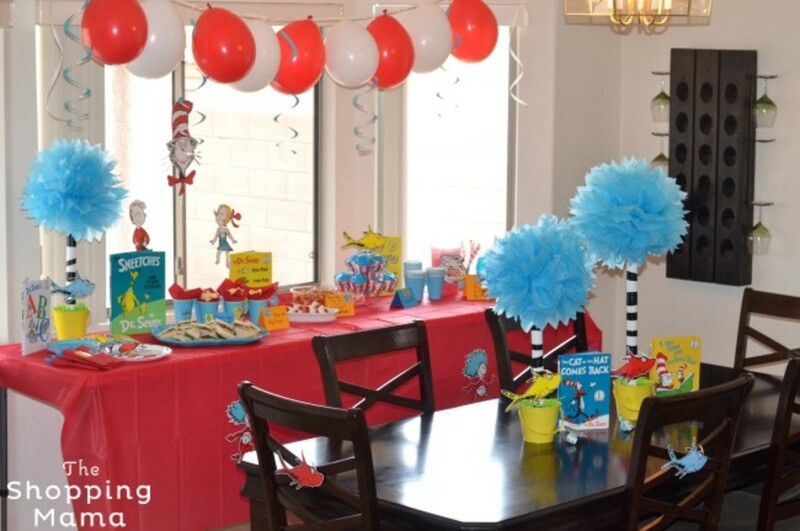 We&apos;re super excited to celebrate, but we got lucky enough to help put together this super fun, whimsical Dr. Seuss party recently. 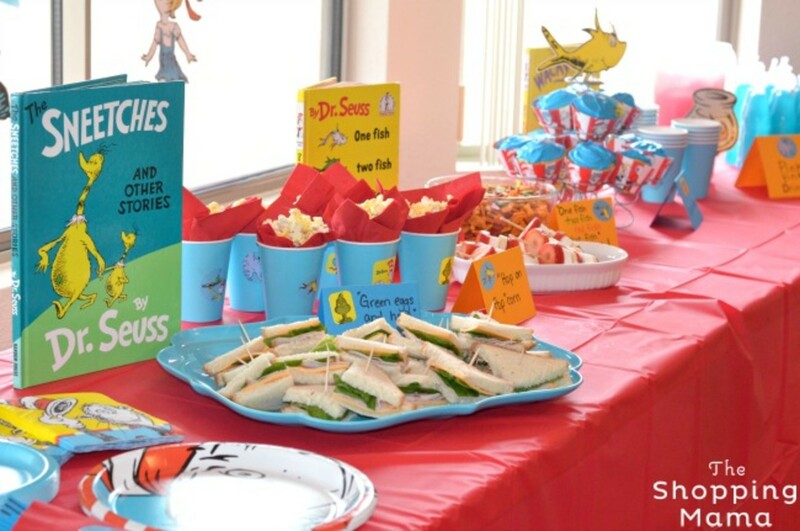 With bright colors, fun characters and Birthday Express Dr. Seuss themed party supplies, this party is almost as much fun to put together as it was to celebrate. 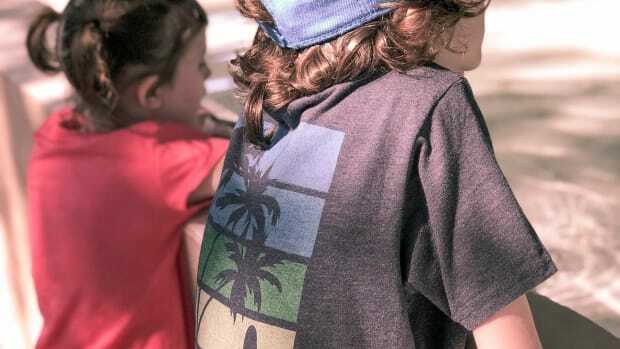 With National Read Across America Day (Dr. Seuss Day) coming up on March 2nd, it&apos;s a perfect excuse to celebrate some of our favorite children&apos;s books. 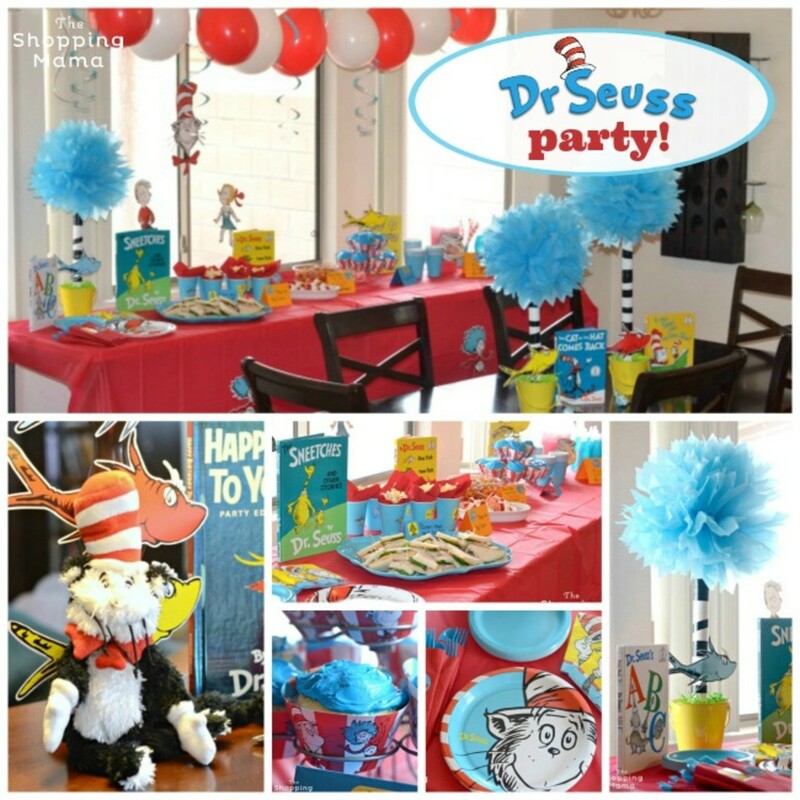 A Dr. Seuss party is easy to adapt for either a baby shower, first birthday, toddler, or elementary school age birthday or school party in general. 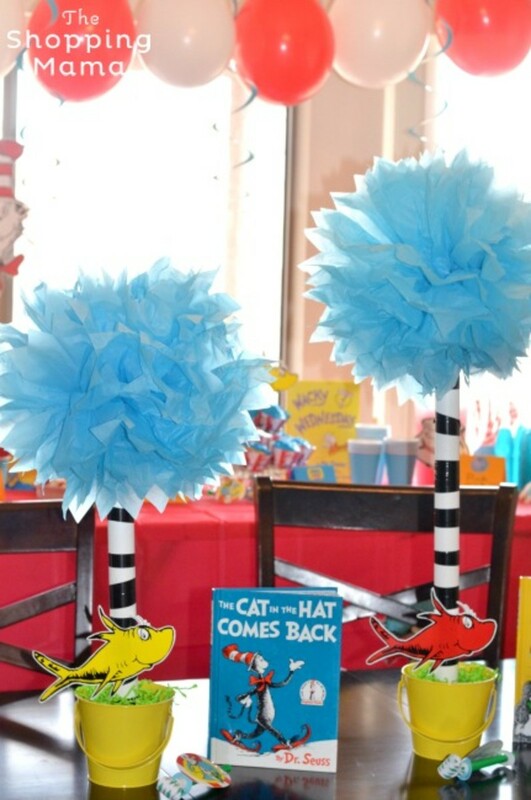 One of the easiest things to decorate with are Dr. Seuss books. Gather up all the books you own or borrow some from your friends to place around on the tables. 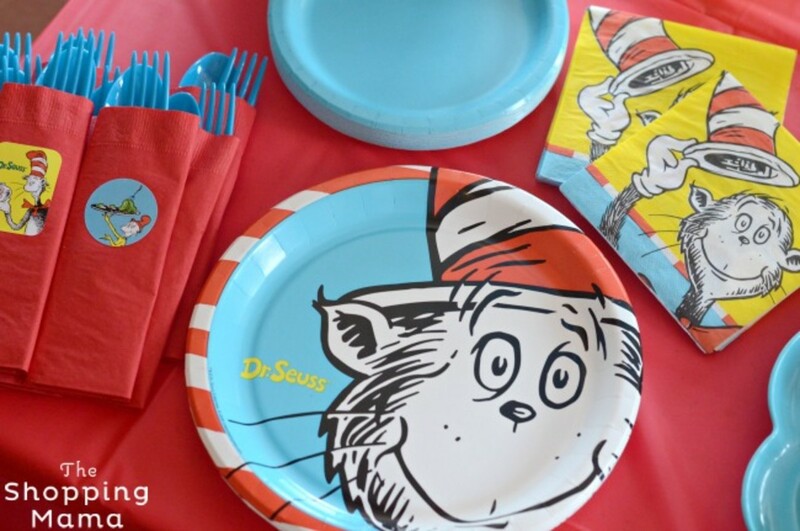 I love these Dr. Seuss Cat in the Hat plates and napkins. We put a basic red table cloth on the table and used coordinating aqua blue dessert plates to pull it all together. 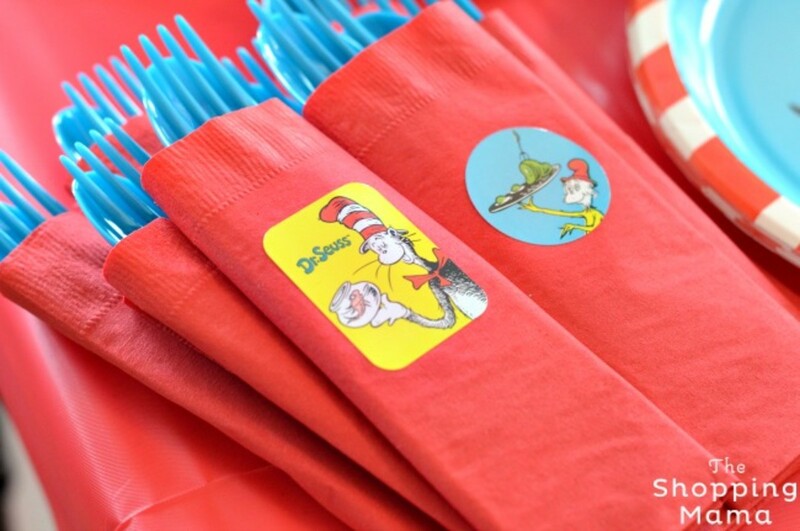 To fancy up my silverware I wrapped each set in a red napkin, taped it on the back and placed a Dr. Seuss sticker on the front. These made a pretty presentation. 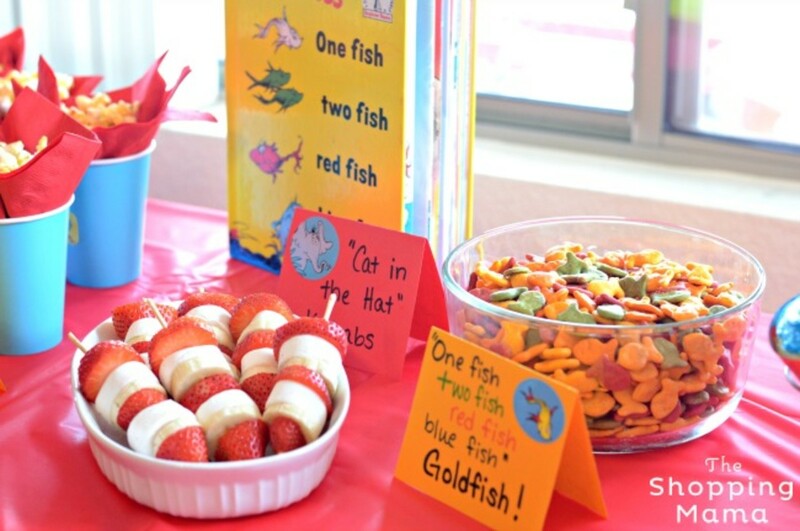 Planning the food for this party was so much fun! 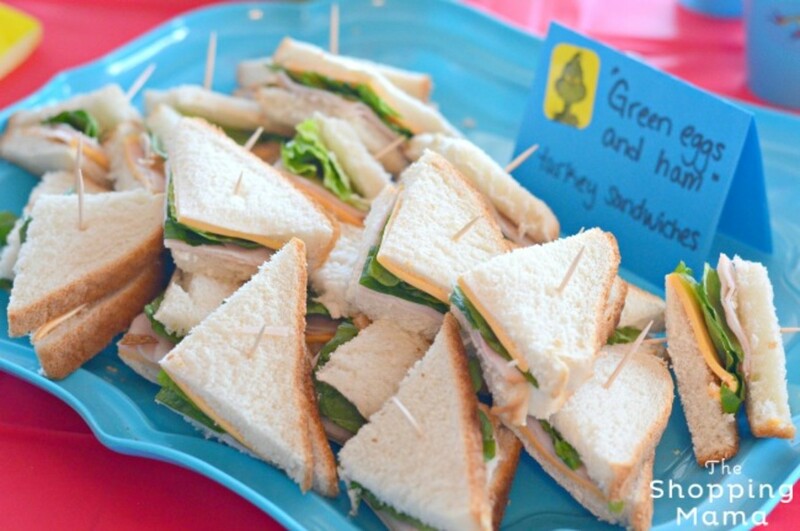 We served "Green Eggs and Ham" Turkey Sandwiches, "Hop on Pop"-corn, "Cat in the Hat" kebabs, colorful goldfish crackers, and cupcakes (of course!). 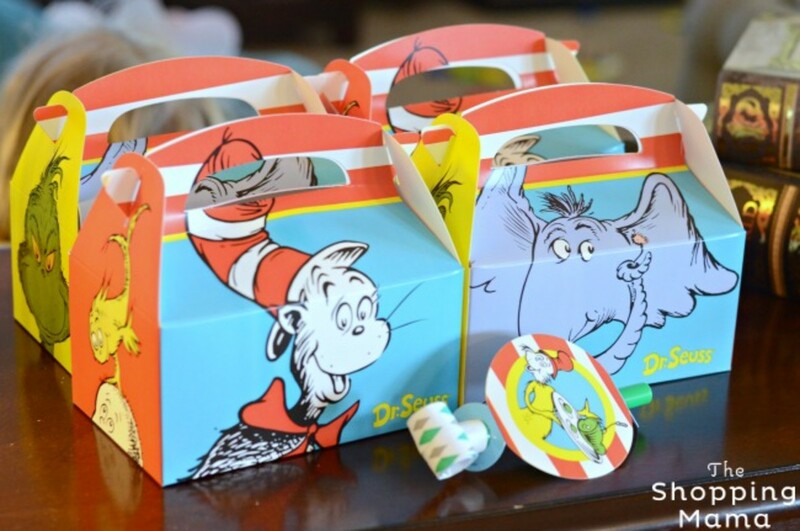 I used the same Dr. Seuss stickers on the "Hop on Pop"-corn cups that I used for my silverware. 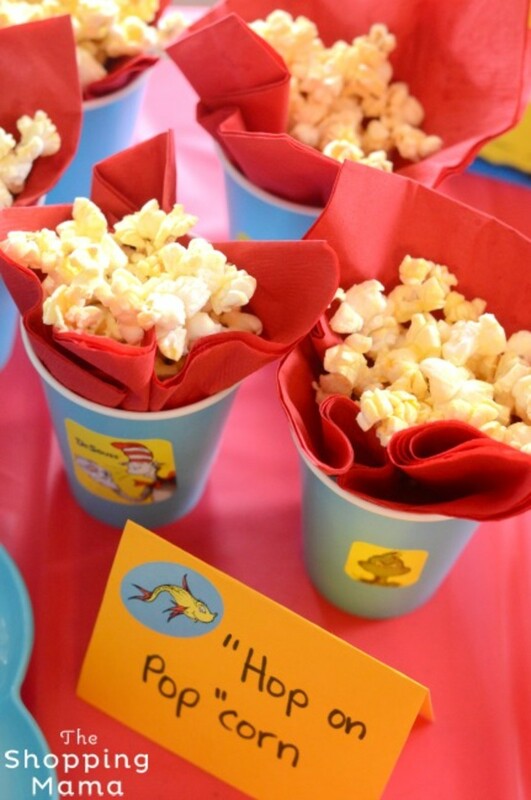 I stuffed a red napkin into an aqua blue cup and filled with popcorn. 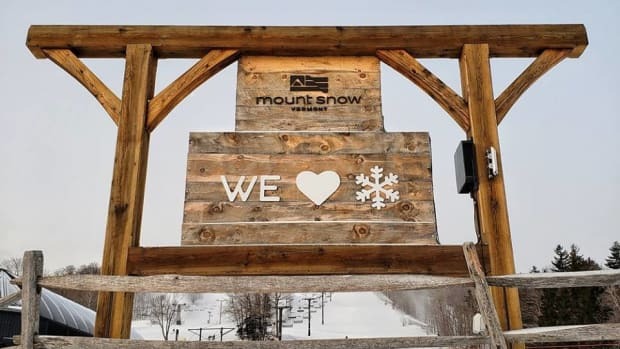 We added the stickers for more decoration and fun! I even used the stickers when I made the tent cards to label the food. 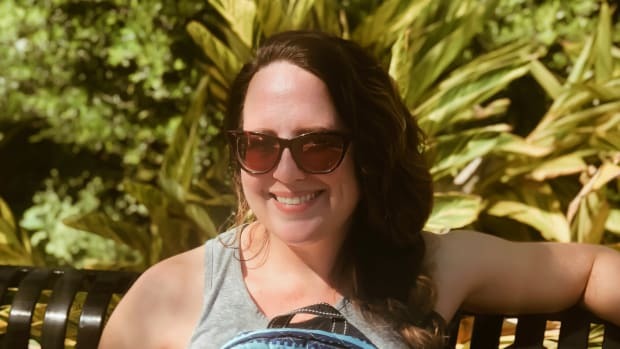 I just used coordinating red, blue and yellow card stock that I already had in my stash, decorated with the stickers and wrote the fun names with a marker on each of them. 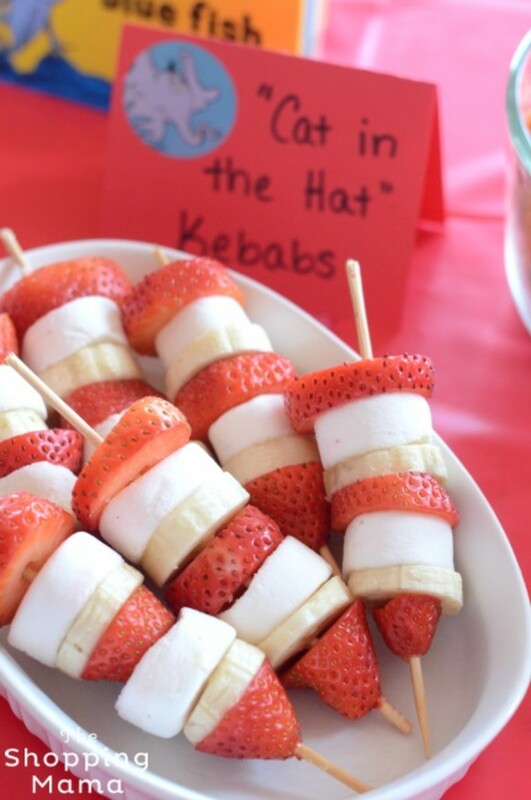 The kebabs are a play on the traditional red and white "Cat in the Hat" striped hat. Sliced strawberries, bananas and marshmallows skewered on a wooden kebab stick. You could leave out the marshmallows but it gave the kebab a bit more white than just the bananas I was originally going to use. 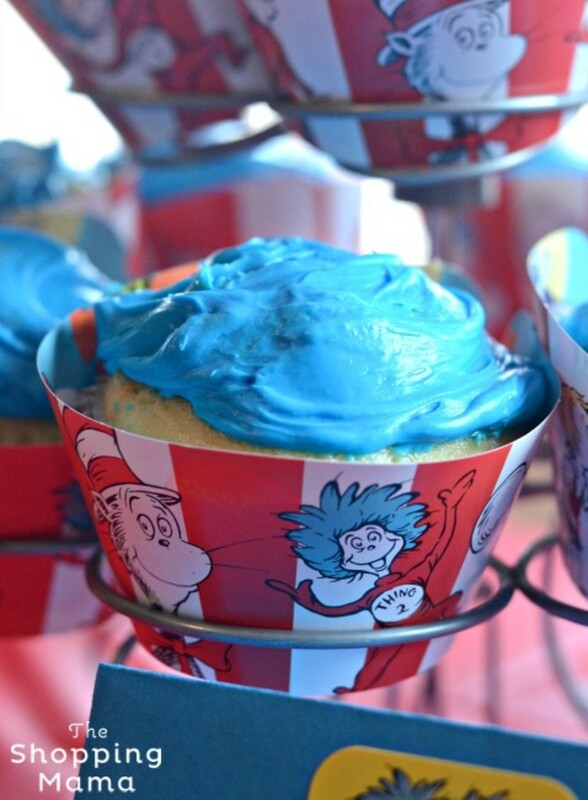 We baked the cupcakes at home and put them in these fancy reversible cupcake liners featuring Thing 1 and Thing 2. The bright blue frosting reminds me of their wacky hair! 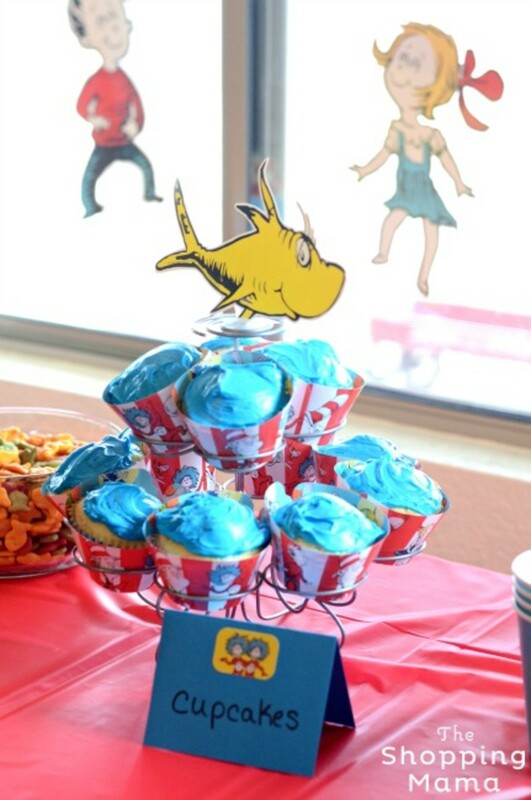 1 Fish, 2 Fish paper cutouts were colorful and fun and since there were a lot of them in the pack, I used them to decorate the cupcake stand, backs of the chairs and anywhere else I thought needed a touch of Seuss! Even the drinks were fun. 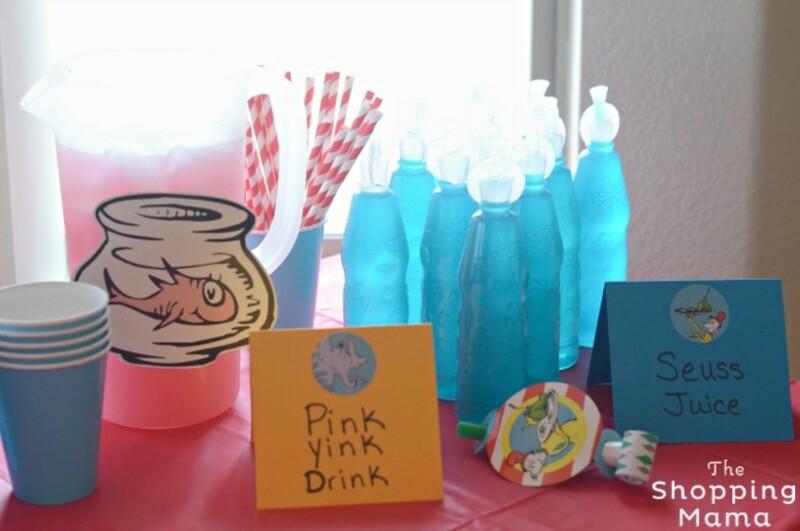 The "Pink Yink Drink" is strawberry lemonade and the "Seuss Juice" is bottled Kool-aid bursts. My absolute favorite thing at the party were these DIY Trufulla Trees inspired by The Lorax. We made these wacky trees using yellow buckets, fluffy blue decorations, pvc pipes, electrical tape and Dr Seuss 1 Fish 2 Fish cutouts. 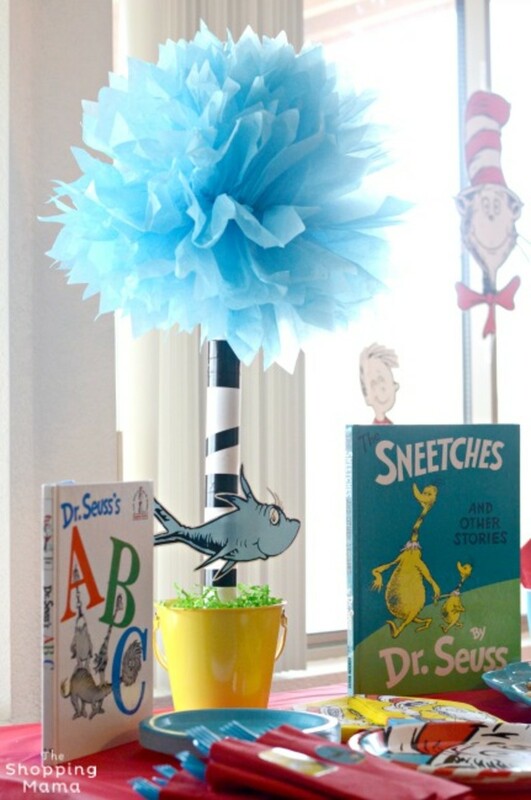 The Trufulla trees, paired with some Dr. Seuss books, made a great centerpiece for the table. We even set up a station for guests to sign the "Happy Birthday To You" book as a keepsake. 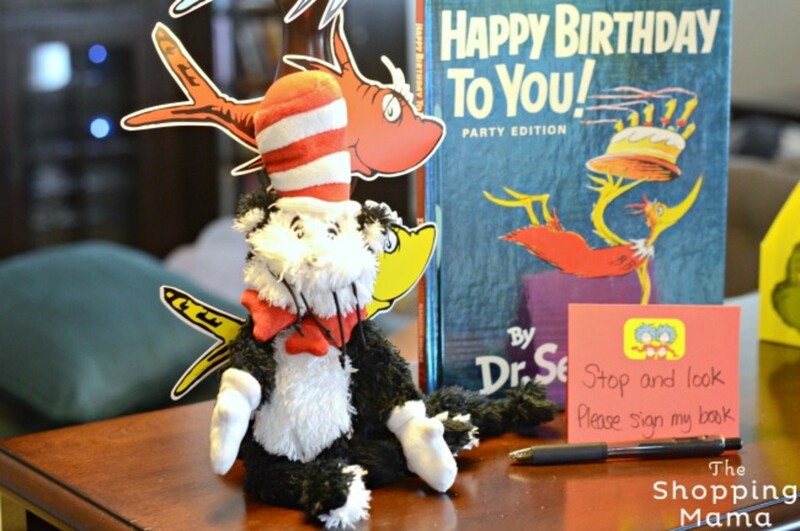 The Cat in the Hat plush was used as a decoration during the party and then given as a gift afterwards. 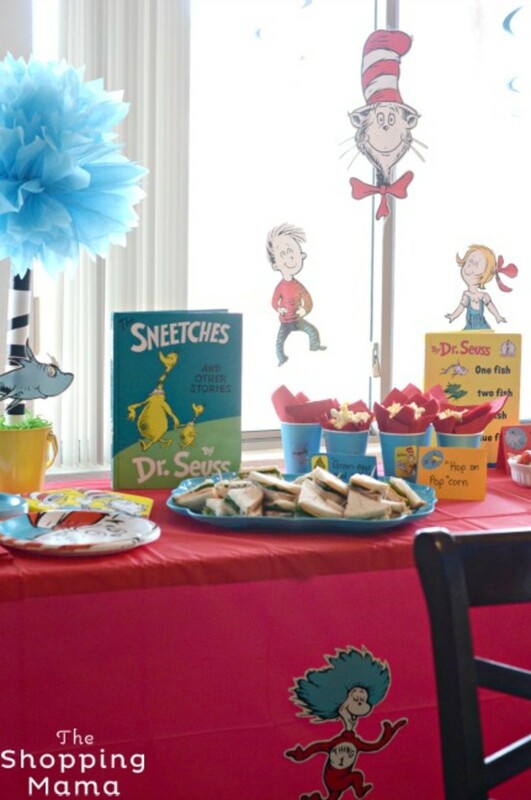 Throughout the party we used Dr. Seuss giant character cut outs. The pack included 6 characters: Cat in the Hat, Things 1 and 2, Fish in the Bowl, Boy and Girl cutouts. For only $6.49 this was a steal and a great way to add some of the characters into the party. The Cat in the Hat face is the biggest measuring 15" x 8". They are all double sided and made on sturdy card stock type paper. And of course don&apos;t forget goodie bags. These favor boxes come in sets of 4 and offer a great way to send candy, stickers, blow-outs, and other party favors home with your guests. 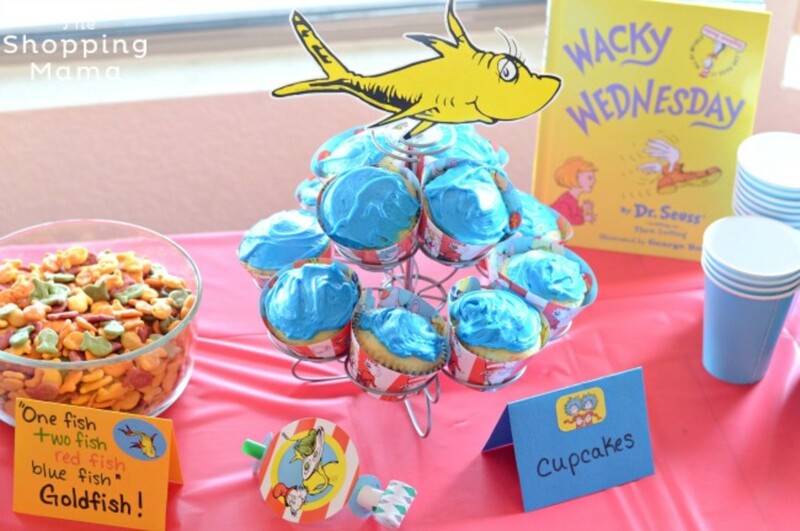 Now you&apos;ve seen all of our fun Dr. Seuss party. Time to go throw your own!! 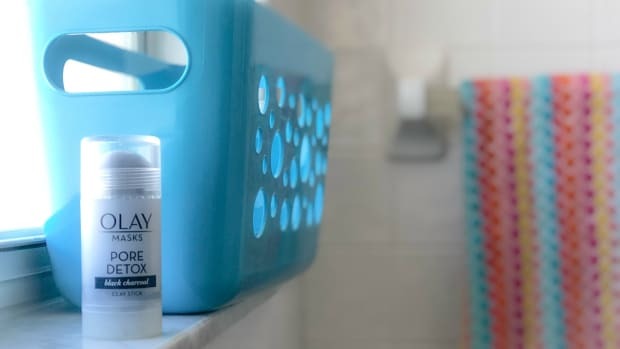 The Shopping Mama was not compensated for this post. 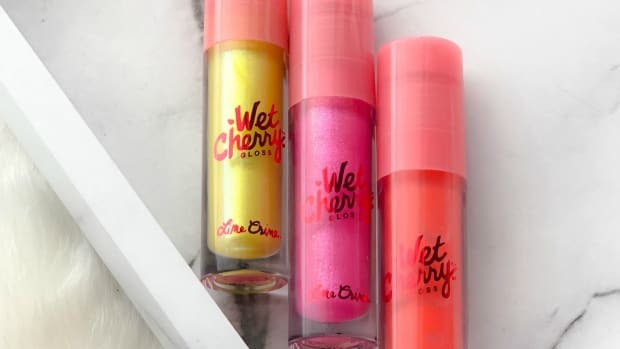 We were given some samples to use.